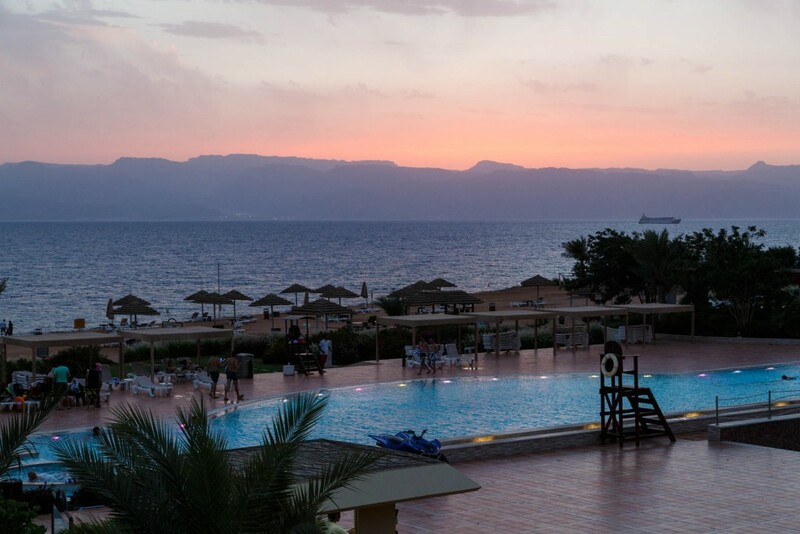 The Radisson Blu Tala Bay Resort in Aqaba, Jordan is built on the coast of the Red Sea on an isolated strip of land 20 minutes drive south from downtown. 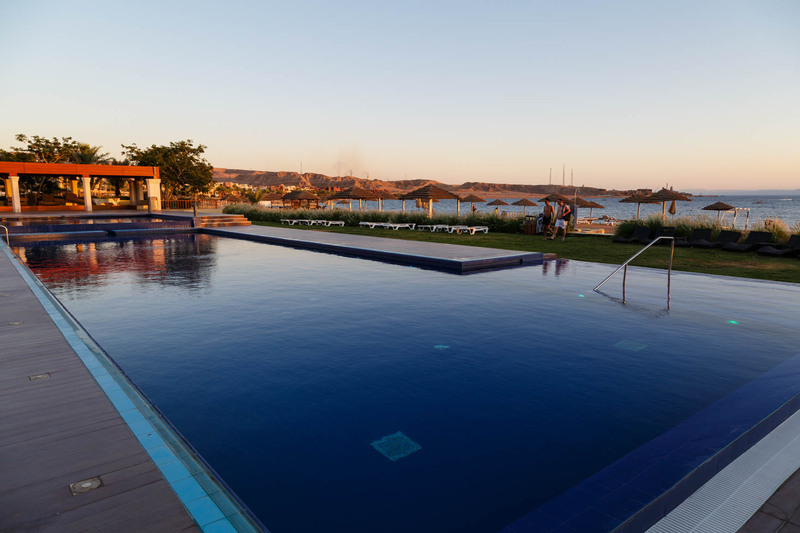 It’s a new hotel located in a development project called Tala Bay and is part of an Aqaba Special Economic Zone Authority development project intended to attract foreign tourists and investment. Unfortunately, there weren’t many tourists at the time due to cyclical factors and the looming threat of ISIS in the region. As this section is Jordan’s only seaport there are many shipping docks and other industrial elements along the drive down to Tala Bay. There’s also a factory and power lines along the road from the resort. The beach is very rocky and the Red Sea’s water is too cold for swimming. The area is still being developed with a golf course and other hotel/condos slated to be built. The area had an artificial, sterile, and perhaps eerily deserted feeling, but it was a relaxing place to stay and do nothing. We had originally intended to spend two nights to position ourselves for Petra and Wadi Rum, but we ended up spending six. The nightly rate was $140 for a standard room, so at 38,000 Club Carlson points per two nights, this was a great deal. Breakfast was included and we got upgraded two categories to a Junior Suite for the first four nights. For our second stay of two nights, they upgraded us three categories to a Family Suite. Occupancy was incredibly low. The exterior of the resort was very beautiful and clean. 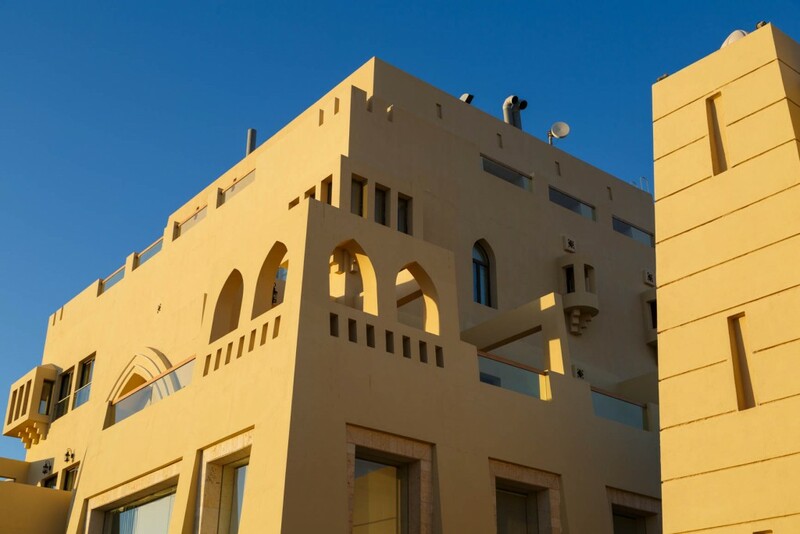 It was a blend of Middle Eastern and modern architecture. Sunsets at the resort were gorgeous. There were live performances every night along with shisha smoking. The free breakfast every morning was one of the reasons why we decided to stay so long. The food options around the resort were pretty scarce and expensive. After breakfast, we’d walk to the Tala Bay shopping complex to get $12 burgers. We were usually the only customers. The complex felt incredibly deserted. In terms of amenities, the hotel has regular free shuttles to and from downtown Aqaba. The drop off/pickup point is the parking lot across the street from the only McDonalds in town. We used it every night to go to town for dinner. There is also a complementary shuttle to and from the airport, which we used on our last day to fly out of AQJ. Shockingly, there’s no indoor gym. We stayed inside most of the day since temperatures were over 100F and unbearable to even go swimming in the pool. Wifi is free, but limited to three devices. We called the front desk and they were able to add one device at no charge. Overall, this resort was a great place to relax for a few nights and burn Club Carlson points – certainly a steal at 19,000 per night in a suite with breakfast for two. It has great views of the Red Sea but Tala Bay leaves much to be desired in terms of eating options and authenticity. We made it our base for travel to Wadi Rum and Petra. This is a part of the series on Chasing Club Carlson Hotels Around the World.